Human trafficking is a form of modern slavery that occurs in every state, including Arizona. 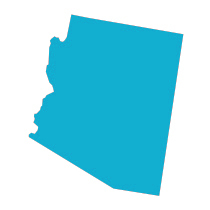 The NHTH works closely with service providers, law enforcement, and other professionals in Arizona to serve victims and survivors of trafficking, respond to human trafficking cases, and share information and resources. Learn more about human trafficking in Arizona by browsing the hotline statistics, resources, and local events listings below. The below statistics are based on the signals -- phone calls, emails, and webforms -- received by the NHTH that reference Arizona. To protect the identity of the people we serve, the NHTH does not disclose exact statistics related to venues, industries, or caller information when referenced fewer than three times. 2018 statistics are current as of 6/30/2018. 2014 statistics were updated on June 24, 2015, due to data discrepancies. The following information is based on incoming signals made to the NHTRC from January 1, 2015 – December 31, 2015 about human trafficking cases and issues related to human trafficking in Arizona. Are you holding a human trafficking event in Arizona? Submit an event for consideration here.